In Elif Shafak's weekly column in the New Statesman, she describes her interview with Seán Rocks during the Ennis Book Club Fesival as “one of the most inspiring events I have done." We felt a great connection during the festival and, it seems, so did she. "I walk back on the streets of Ennis under drizzling rain. Light pours out from the pubs, with sounds of laughter and singing in the background, and I feel, under this vast sky, how profoundly connected we all are, fellow human beings, beyond all national borders and imaginary tribes." Thanks to all of you who came to our 2019 Festival. We'd love to hear what you thought of it, and suggestions of what you would like next year - yes, we're thinking about that already. 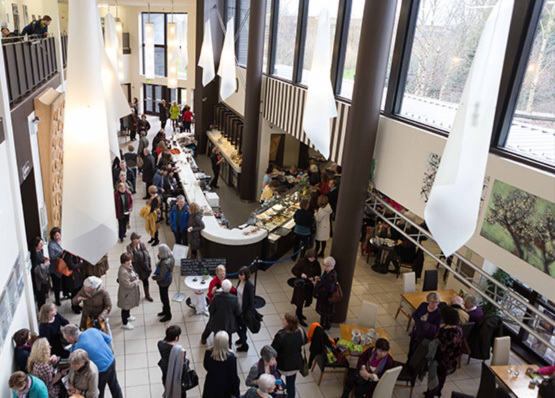 Everyone who completes a survey is entered in a draw for two free tickets to the Ennis Book Club Festival in March 2020. Due to unforeseen circumstance and with regret on behalf of the organisers the Mis event is now cancelled. We sincerely apologise for any inconvenience that this may cause and refunds will be provided on all tickets purchased. Please contact glór Box office on 065 684 3103 -- Monday to Saturday from 10am to 5pm regarding refunds. Mis le Biddy Jenkinson will now take place in the Studio in glór on Saturday 2nd March at 4pm instead of Dánlann an Chláir as previously stated. Apologies for the change and we hope it does not inconvenience you. Clare FM's Morning Focus with Gavin Grace will be having a fantastic ticket giveaway during the week of 18th February - 4 tickets to win every day. So listen in between 9 and 11am for a chance to win. Would you like us to say hi? We’ll be giving a shoutout at some of our main events to some of the bookclubs who are attending, so send in brief details and your club might be included. All the better if you can mention something special or interesting about your bookclub and what event(s) you are definitely attending. Send your details to info@ennisbookclubfestival.com with "book club request" in the subject line. Are you going to an event on your own during this year's Festival? Do you like to chat with people beside you? If so, you might be interested in booking a Solo Seat. These are small groups of seats reserved for people booking a single ticket for events with allocated seating. If you want to make it even easier to meet people at our friendly Festival, specify a Solo Seat when you book for events at glór. Events outside glór are free seating. 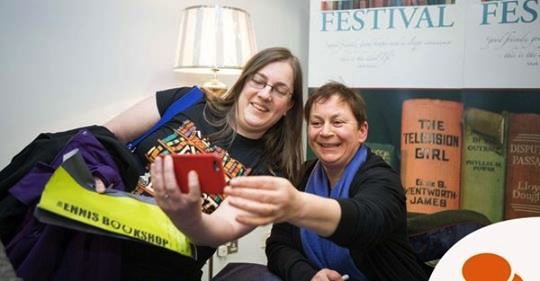 The Clare Champion have teamed up with Ennis Book Club Festival to run a book festival themed window display competition for local retailers over the course of the Festival. The committee are represented on the judging panel, so let us know during the festival which displays really caught your eye - and it's nice to let the businesses know as well. If you are a business and would like to find out more, contact the Clare Champion or info@ennisbookclubfestival.com. Where is Elif Shafak from? EBCF are collecting information from locals who would like to host visitors to the Ennis Book Club Festival at a reasonable fee. We think it’s a lovely way to connect locals and visitors and maybe even make new friends. Keep an eye on our accommodation page for details. If you think you would like to host a visitor, contact us by emailing info@ennisbookclubfestival.com. We've had our first Beyond Borders Book Club event for the season, when Malgorzata Buchalik gave a great introduction to Stanislaw Lem. Our next meeting will be on Thursday 29 November at 8.00pm in the Rowan Tree Café. William Woghlemuth will discuss the life and work of Hungarian poet Gyögry Faludy. The event is free and all are welcome. Check here for all Beyond Borders Book Club dates. EBCF is delighted to be a finalist in the Clare Business Excellence Awards. This is a credit to the wonderful volunteers who help out with such enthusiasm during our festival weekend and to all the individuals, organisations and business in the community who support us in so many ways. The other worthy finalists are Ennis Tidy Towns and the 12 O'Clock Hills project in Kilkishin (a walk we highly recommend). The winner is announced by Ennis Chamber on November 15th. The Festival Administrator will work closely with and report directly to the Festival Committee. (S) he will also support the Festival Director in implementing the Book Club Festival. We are delighted that we have been able to reschedule a number of events following the unfortunate cancellation of the EBCF weekend due to snow. These include the Sebastian Barry Tribute, Ruth Fitzmaurice in conversation with Mick Heaney, the Children and Young People’s Program and the Beyond Borders Book Club Panel Discussion. Sally Rooney and Mary Morrissy will take part in an EBCF event at Listowel Writers’ Week. See here for more details. Ennis Book Club Festival have decided to cancel all events as part of Ennis Book Club Festival due to the ongoing difficult weather conditions. Refunds will be issued by glór, on behalf of Ennis Book Club Festival, for all Festival events. This difficult but necessary decision was taken in the interests of staff, contributor and audience safety.